The Phantom Tollbooth 50th Anniversary Edition by Norton Juster. 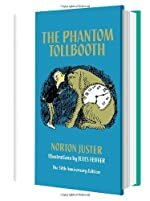 Review: Norton Juster has re-released a book that will blow your socks off - The Phantom Tollbooth. In this classic tale, Milo, Tock (a helpful watchdog), and Humbug are on a mission to bring Rhyme and Reason back to Wisdom. Milo is a typical boy who is bored with school and bored with life. However, in The Phantom Tollbooth, Milo's world is turned upside down. One afternoon, Milo comes home from school and finds a package with his name on it. He opens it and finds a note stating that the package contains a tollbooth that will take him to one of two places. He picks Dictionopolis. Milo gets into the provided car and begins his adventure. Milo quickly finds that something is not quite right in this new world. For instance, his car only goes if he is thinking. Eventually, however, Milo makes it to Dictionopolis where he is given the ultimate task to bring back Rhyme and Reason. However, both the King of Dictionopolis and the King of Digitopolis banished Rhyme and Reason, and Milo needs both their approval to bring Rhyme and Reason back. The Kings, however, haven't agreed on anything since they banished Rhyme and Reason. Will Milo be able to convince the warring brothers that Rhyme and Reason need to be released? What other adventures will Milo and his newfound friends face along the way? The Phantom Tollbooth hooked me right from the beginning with all of its twists and turns. The author built up suspense by putting the three main characters into dangerous situations. I tried to guess what was coming next, but I was way off. He also uses a lot of figurative language. For example, Tock is a watchdog that has a body made out of a watch. I never wanted to stop reading. The craziness and excitement of this fantasy made it a must read. This book was one of the best books I have ever read. We would like to thank Random House for providing a copy of The Phantom Tollbooth 50th Anniversary Edition for this review. Have you read The Phantom Tollbooth 50th Anniversary Edition? How would you rate it? It sounds like a really funny book! Great review Deegan!